Before you buy, visit antennaweb or antennapoint check how many broadcast towers surrounding you within 60miles. 2) Place amplified tv antenna in an optimal position, usually window or on a wall. 3, Reposition the amplifier digital tv antenna in a different location. It is suggested place it higher on a wall or closer to a window. Sometimes moving a few feet can make a difference. 4, keep the tv antenna away from those big power consumption devices interference, such as air conditioner, refrigerator and microwave oven,etc.A metal roofed house can cause signals to be disturbed. 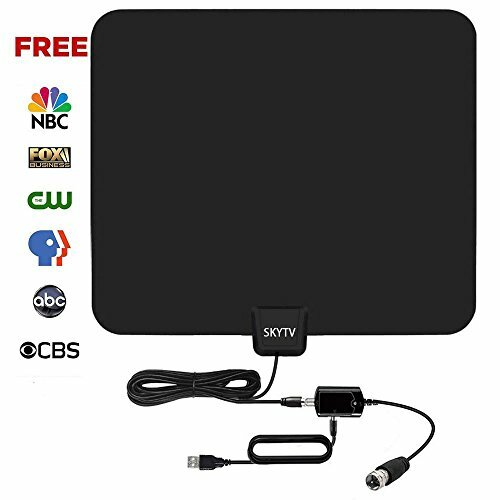 FREE FOR LIFE - SKYTV TV Antenna can get all of your local free channel if operate correctly, you won't pay any hugely expensive cable or satellite fees again! Get the free HD Channels like ABC, CBS, NBC, PBC&Fox in 60+ mile rang from Broadcast Tower, start to access all of the news, sitcomes, kids amd sports programs! If you have any questions about this product by SKYTV, contact us by completing and submitting the form below. If you are looking for a specif part number, please include it with your message.